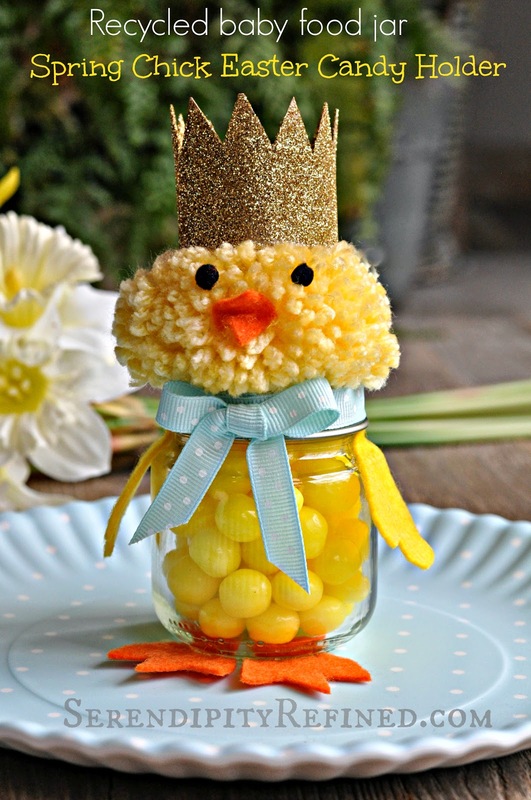 Yes, there is a yellow pom pom Easter chick candy holder made from a recycled baby food jar in the photo above. And YES, it is wearing a sparkly gold glitter crown. Why? Sometimes, we all need a little silliness in our lives. Something that's done purely to make someone smile. Something that is unnecessary and really makes no sense....like a chick...wearing a crown. Sure, the bunny is the one that most people think of when Easter animals are discussed. because CHICKS RULE! ...you know, in a regal sort of way...with glitter crowns! ....at least the table where the "little's" sit. 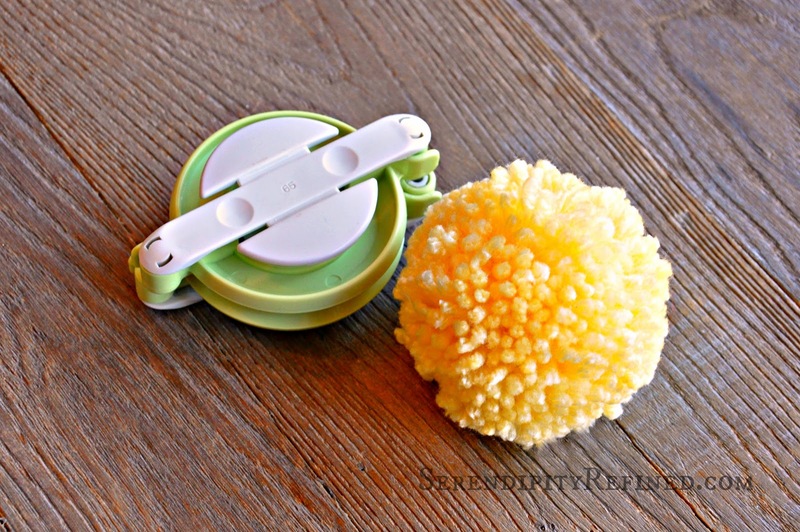 A small baby food jar. 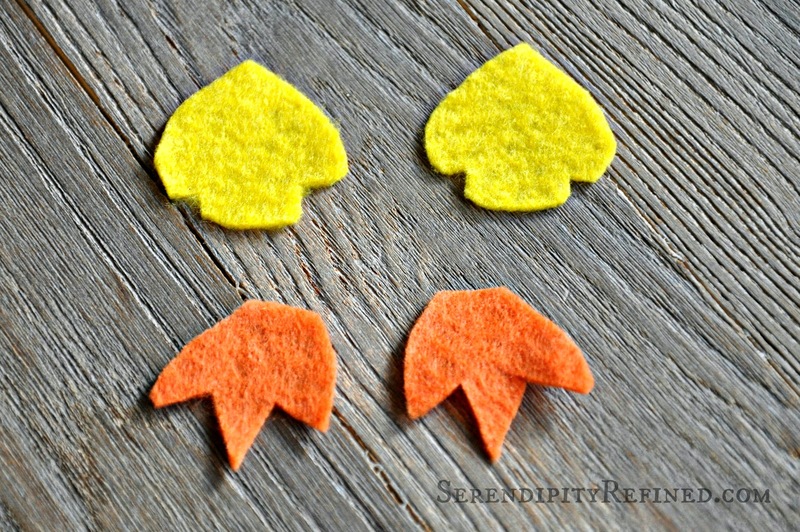 Yellow felt wings, orange felt feet, an orange felt beak and two black pom pom eyes. For the record, I seriously considered goog-ly eyes. In fact, if I could have found the plastic container that holds them, you can bet that these chicks would have had eyes that followed you around the room but, I'm pretty sure that they're packed somewhere in the middle of the tallest stack of boxes in the dining room so instead, they have plain black pom poms for eyes. 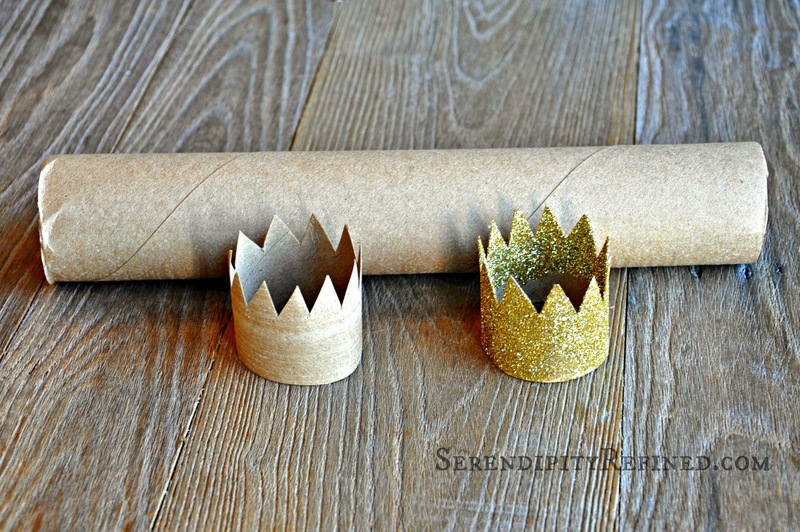 I made the crowns using a 2 inch piece of paper towel tube and some gold glitter. Then, I assembled the whole thing in about five minutes using hot glue. 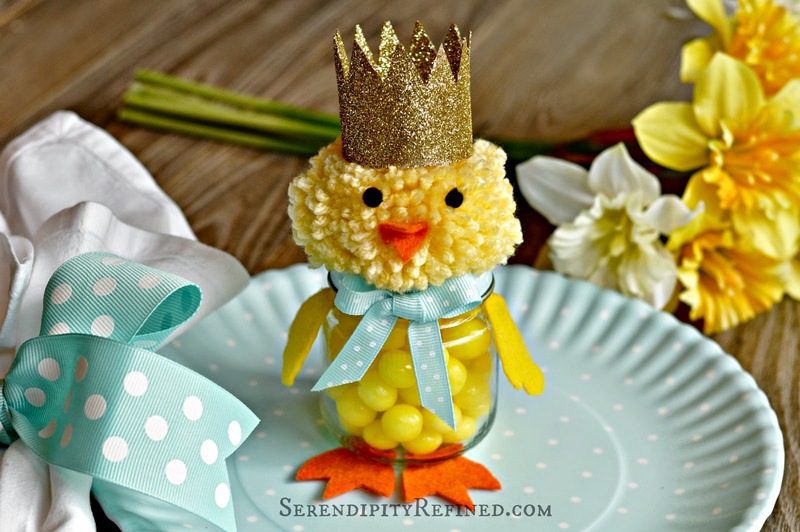 This left plenty of time for contemplating things like whether or not to make a fur trimmed cape for the chick candy holder..
...whether the lack of hands would stop it from being able to properly hold a scepter. ...and whether or not I should make glitter crowns for the adult members of my family to wear during Easter dinner. I haven't decided yet but let's just say that it's under consideration. Silliness is good for the world. Emerson said so. 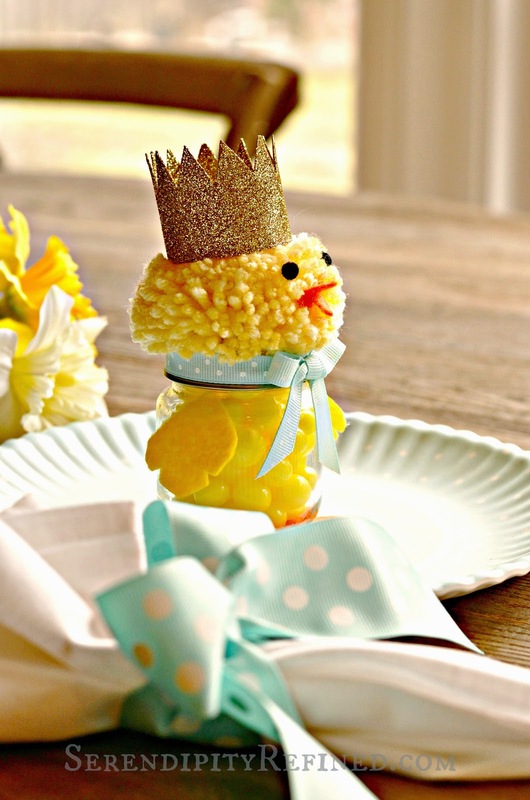 I think that this spring chick is pretty adorable filled up with yellow candy, standing in the middle of a polka dot plate, wearing a silly gold glitter crown. Don't you? 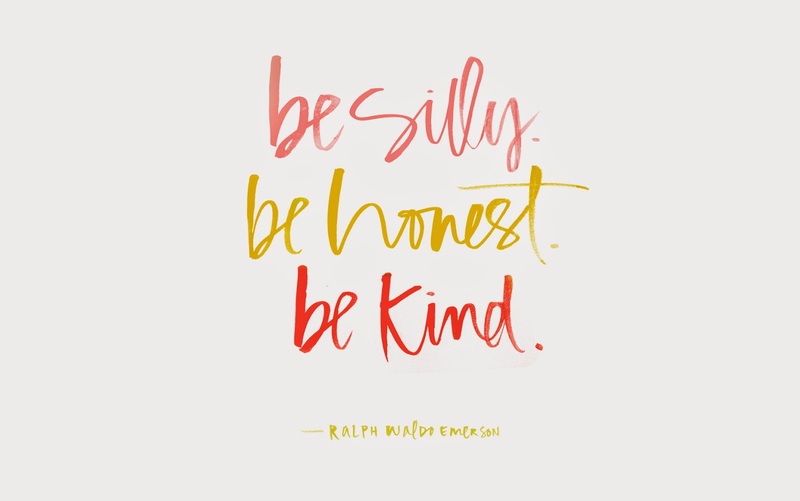 This year, embrace your silliness! 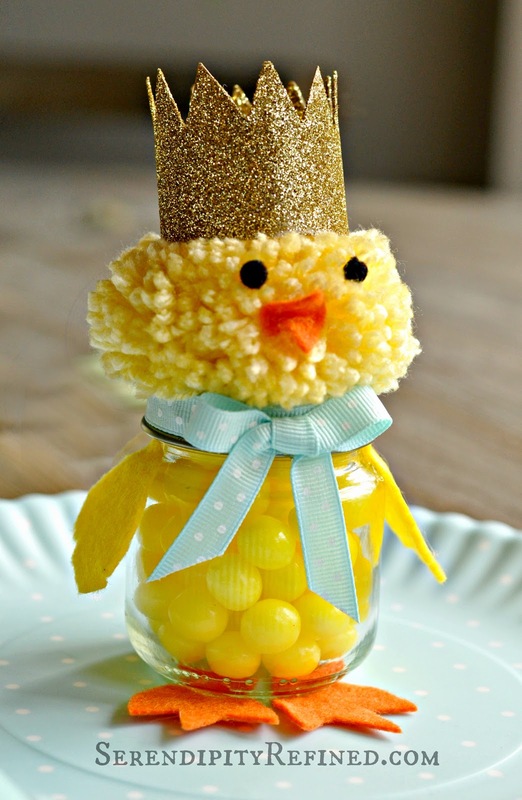 Make some candy holding baby food jar chicks of your own. 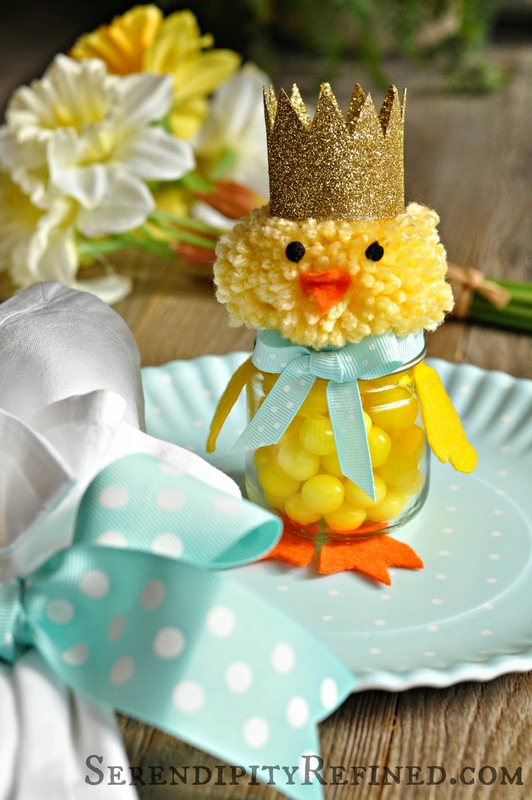 They're a great Easter project to do with children, too. 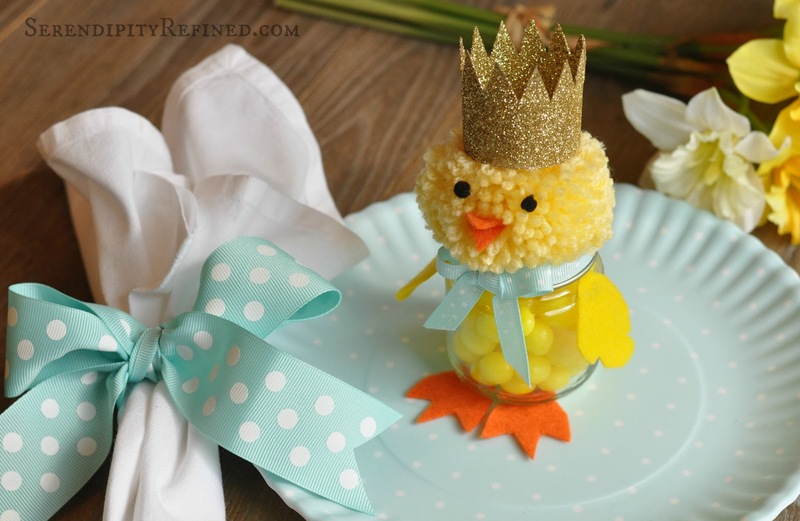 and upcycled baby food jar candy holding chicks.... wearing crowns. and maybe at least one adult wearing a crown, too!